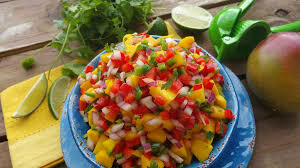 Combine the mangoes, red bell pepper, red onion, cilantro, and jalapeño pepper in a bowl. Add the lime juice and 1 tablespoon of lemon juice, and toss well. Season to taste with salt and pepper, and refrigerate for at least an hour to let all the flavors meld. Enjoy with nice warm tortilla chips.